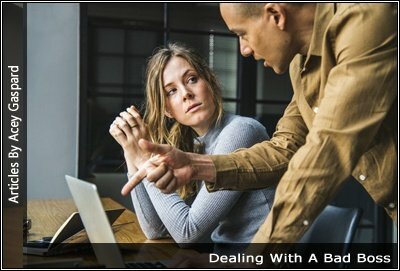 Dealing With A Bad Boss Shouldn’t Be Part of Your Job! Have a look at these short and sweet tips that can help you come up with a permanent solution for your work situation. This is the time for you to become the best person you can at your job. You have to take it up a few notches so that you can start firing back by becoming the best you are at your job. You won’t have a lot of power to fight back if you are lousy at your job. When you were hired, you should have received a job offer. This will outline your responsibilities. Go over this document and identify any issues you are neglecting. Is your boss the top person in the organization, or does your boss report to someone? If your boss is the top person in the organization, then you won’t be able to talk to anyone higher up in the company. You have keep in mind that your boss is the only person you talk to. Take the time to write down the problems you are having with your boss. Doing so will you give you a clear idea of what the actual problems are and allow you to decide if the issues warrant action to deal with the situation or if it is something you may be contributing to. You must be doing something to contribute to the issue. Unless it’s a personal vendetta toward you, your boss has no reason to treat you badly. Questions might be: Are you doing your job? Are you causing your boss problems? Are you not pulling your weight? Are you making constant mistakes are you showing up for work on time? 6. Is it Just You or Everyone? Is your boss treating only you badly, or is it, everyone? If it’s just you, you need to figure why and try and rectify the issue. It’s important to write each incident down with dates and times and detail. This will give you a log to look back on for trends, as well as become a document if you need to talk someone about the issues occurring. Looking at your boss’s point of view may open your eyes to the situation. Is your boss under a lot of stress? Is your department under-budgeted or under-performing? Are there a lot of problems that are causing your boss stress? Keep an eye out for a big problem your boss is having, and come up with a good solution or suggestion to improve the situation. Be sure to present the solution in private. You don’t want to do it publicly, because it may look like you are showing up your boss. Presenting to your boss, suggestions to problems, will get your boss’s attention, because you are noticing the problem and you are thinking of solutions, as opposed to just presenting problems. Is there anything you need help with? Are there any issues I can assist you with? Are there any pressing problems you need assistance with that I can help with? Is there anything I can do to make your job easier? Be careful: If you are overwhelmed with work already, you don’t want your boss to say it seems like you are bored. Maybe you don’t have enough work. Simply stepping up to try solving problems or even reliving some of the responsibilities of your boss can go a long way. If you still have no luck, see if you can meet with your boss to voice your concerns and talk about the issues. Many times, your boss may not even be aware of the issues and simply talking about and presenting the issues you have may go a long way. If nothing else works and there is an HR department, see if you they can help. Be careful: You must present a strong case with documentation, and you must weigh the pro and cons if you lose your case at HR. If you don’t get the results you want, try to transfer to a different department if possible. If all else fails, it may be time to find another job. You don’t need to work in a stressful environment. It’s not worth it.